Why not bring a smile to someone's face by treating them to a special day out - and let us get you there in style, comfort and safety in one of our executive vehicles. London, Bath or Bristol theatres are just a short journey away with time to take in a meal and leisurely drink without the risk of drink driving or missing that last train home. 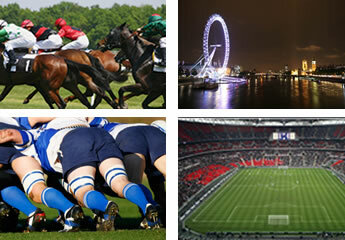 Wembley, Wimbledon, Twickenham, London Eye avoiding excessive car parking and bustling underground stations. London, Henley on Thames or Oxford for that romantic or restful riverside dinner on the Thames. Ascot, Cheltenham or Bath to enjoy a day's racing, champagne, and all the spoils of winning (or losing) knowing that one of our experienced drivers will drive you home safely. Sometimes you just have a special requirement that does not appear on our web site. Don’t worry; we will always try to help. Call us on 01793 644299 and we can talk though your requirements and how we could help solve them.